The federal jobs report for November 2018 highlights the continuation of the strongest employment market in half a century. Now's a great time to find a new job.- if you know how to get your resume seen in today's comepetitive online environment. Now’s the best time In almost half a century to find a new job. But do you know how to get your resume seen in the digital age? On Friday, December 7th, the federal government’s release of the national unemployment statistics for November 2018 highlights the continuation of the strongest employment market in half a century. This was confirmed by strong retail sales for Black Friday and Cyber Monday, with both online stores and brick and mortar retailers seeing strong sales and year-over-year increases in volume. This means that both types of retailers are hiring briskly in anticipation of increased sales. It also portends a stronger-than-ever holiday season, while confident consumers spend more, thanks to lower taxes with lower payroll deductions, and higher salaries driven by employment demand. “Now’s the time to dust off your resume and put out feelers to find a new and more satisfying job”, says Diane Huth, The Accidental Career Coach. “But do you know the secrets to online job success, where more than half of all open jobs are posted and screened using a digital algorithm called the Applicant Tracking System,” or what Huth refers to as The Resume Reading Robots? Huth explains that due to the overwhelming number of job applications received for just about any job posted online, companies have adopted a computerized system that scores and prioritizes job applicants by keyword matches to the company’s hiring criteria. That results in about 75% of all online job applications being rejected by the computer before a human being ever sets eyes on them. And if your resume does survive the computer match process, the recruiter will spend on average just seven seconds quickly scanning the document looking for four key areas of information before rejecting it forever, or setting it aside for a more detailed review at a later time. That includes the ATS System or “Resume Reading Robot”, which seeks key word matches, and the online recruiter, who quickly scans the resume to judge the candidate’s degree, job titles, employer names and years in each role. The last person to see your resume will be the hiring manager and others who will interview you for the job. They will assume that all the other screeners have verified your credentials for the job, and they will be looking for your personality, work ethic, cultural fit with the company and the team you will be working on, your values, and your ability to help the company meet its goals. At that point you want to pique their interest with the human part of your personality – your life story, your passions, your grit and determination, and your vision for the company and your future in it. “Once you really understand the online job funnel today, you will realize it is fairly useless to just shoot off your resume to different companies without detailed personalization to make sure it meets the precise needs of each of the four groups of people (and computers) who will evaluate it, and accept or reject it at every step of the recruitment process,” states Huth. Huth counsels job seekers to study and understand today’s online job search process to make sure their resume survives the screening gauntlet to end up on the hiring managers desk. To achieve that goal, she offers job seekers a free downloadable cheat sheet to help personalize each resume to beat the Resume Reading Robots and to survive the first major elimination step. 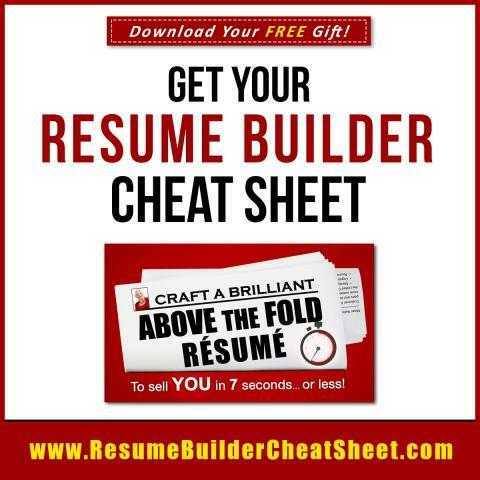 It is available at https://www.ResumeBuilderCheatSheet.com. Diane Huth is a nationally recognized marketing and branding expert and university professor of marketing. She became known as The Accidental Career Coach when she wrote her Amazon best-selling career guide BRAND YOU! To Land Your Dream Job to teach her students how to market themselves. Her newest book, REINVENT YOUR CAREER – Beat Age Discrimination to Land Your Dream Job, helps baby boomers and mature professionals find and keep meaningful employment as long as they want to work. More information is available at https://www.DianeHuth.com.